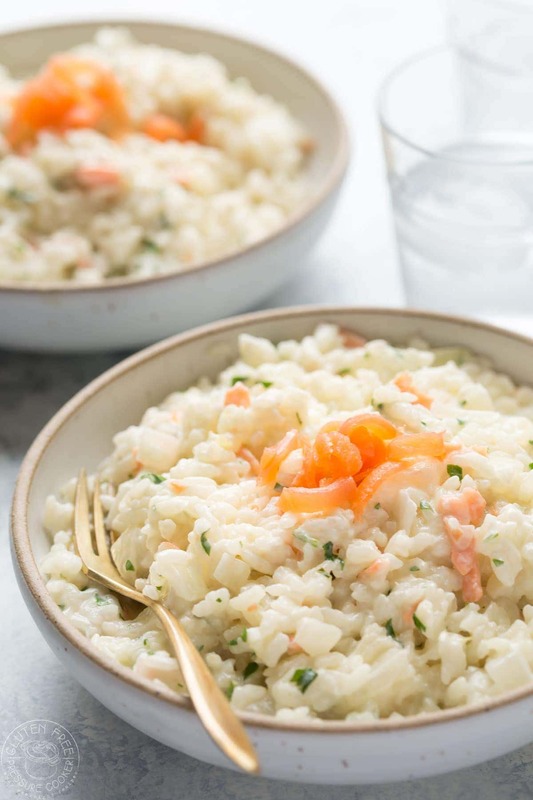 Making Risotto in your Instant Pot is the easiest thing ever, you don’t need to stand at your stove wondering if your pot of rice is going to cook properly, you simply add it to your pot, punch in the programmed time and you’re good to go! It’s important to measure your rice and broth accurately, this will help create a creamy Instant Pot smoked salmon risotto. homemade chicken broth is the best choice for this recipe, but store bought will work if you don’t have time to make your own. You might have to cook the rice using the saute setting for a few more minutes after you open the pressure cooker to reduce the liquid a little more. It doesn’t take long but you’ll need to watch so that the rice doesn’t stick to the bottom. 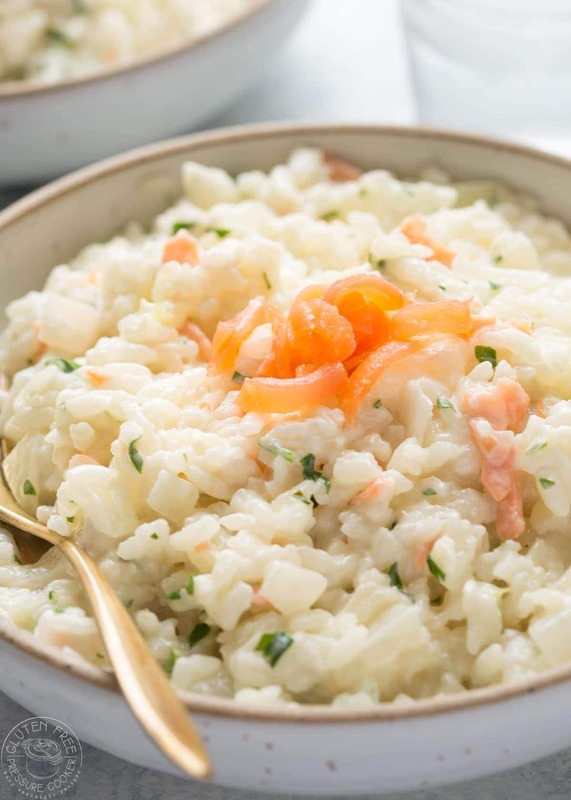 The best risotto rices are short grain rice varieties such as Aroborio or Carnaroli. Arborio is the most common here in the USA and you can find it in almost every supermarket and grocery store. Both those varieties of short grain rice are high in starch which creates a more creamy risotto. CAN YOU COOK RISOTTO WITH WHITE RICE? Easy weeknight dinner with Pressure Cooker Smoked Salmon Risotto with Lemon and Mascarpone cheese! Don't miss the recipe video! You'll see it after the directions. In the inner pot of your Instant Pot or other pressure cooker, turn on the saute function, add the oil and saute the onions and garlic for about 4-5 minutes, stirring frequently. Turn off the saute function. Add the gluten free chicken broth and the Arborio rice and stir. Add the lid and lock it. Turn the steam release vent to 'sealing' and using the 'manual' or 'pressure cook' setting, adjust it to cook for 5 minutes at High Pressure. Taste the rice and see if it's soft enough for your liking, if not, cook for a few minutes more using the 'saute' setting on your pressure cooker, adding a little more both if needed. Add the lemon zest, parsley, mascarpone cheese, most of the smoked salmon (reserve a little salmon for garnish) and stir well until it's all mixed together. If you prefer a more soupy consistency to your risotto simply add a little more chicken broth and stir. 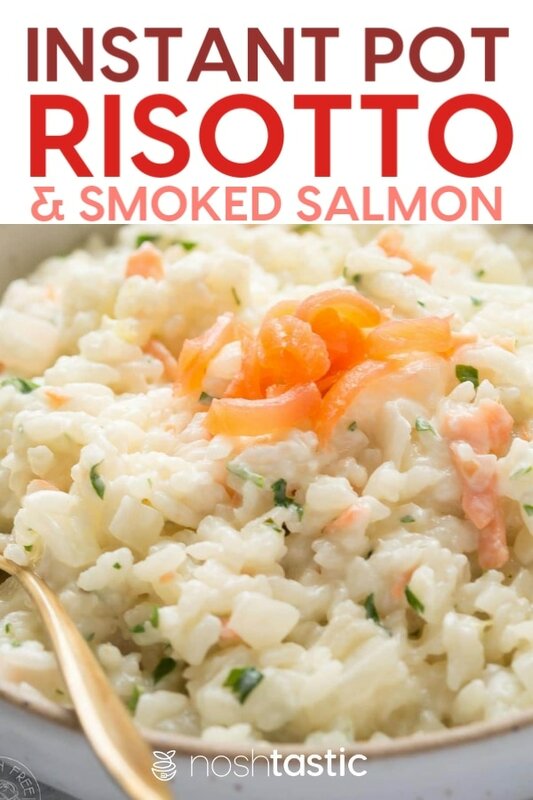 Serve your Instant Pot Smoked Salmon Risotto hot with a little smoked salmon garnish on top and a squeeze of lemon juice. Hi Kathy, it depends on the size of your pressure cooker, if you have a 6qt or 8qt I’d say yes.